It’s end of April and you know what that means? No more finals (and more blog posts)! Sorry for the slight abandonment. Something just had to give this semester, and unfortunately it was the blog. However, I have been writing posts during the past month. I just didn’t want to put up posts that weren’t up-to-snuff quality wise. So look forward to multiple blog posts coming at you for the next three weeks! Anyhow, on to e-books! There has always been a debate about e-books vs. physical copies. Everyone I talk to has their own preference, and I personally am a physical book lover. I like being able to turn the pages and just enjoy the experience of having a physical copy. I was always skeptical of e-readers. I never liked reading books on my iPad because the backlight gives me migraines after a while. However, my stance may have changed a little on e-readers. My issue with reading books is I am a very fast reader. It doesn’t take me very long to finish a novel. Though I love being able to read through a series quickly, it becomes an issue when travelling. Since I read through books fairly quickly, I end up having to pack at least 2-3 books for a week trip. And let me tell you, physical books weigh a lot. I try to buy paperbacks in order to reduce the amount of weight, but it still gets rediculous sometimes. I’ve been looking at “proper” e-readers like the kindle and kobo, and I was happy to find they don’t have a backlight like the iPad. Checking them out in person, they are very different compared to reading from a tablet. I never thought I would say this, but I might switch to e-books for traveling. I’m not saying I’m giving up physical copies of books all together, but I would love to be able to bring books on vacation without feeling like a pack mule. 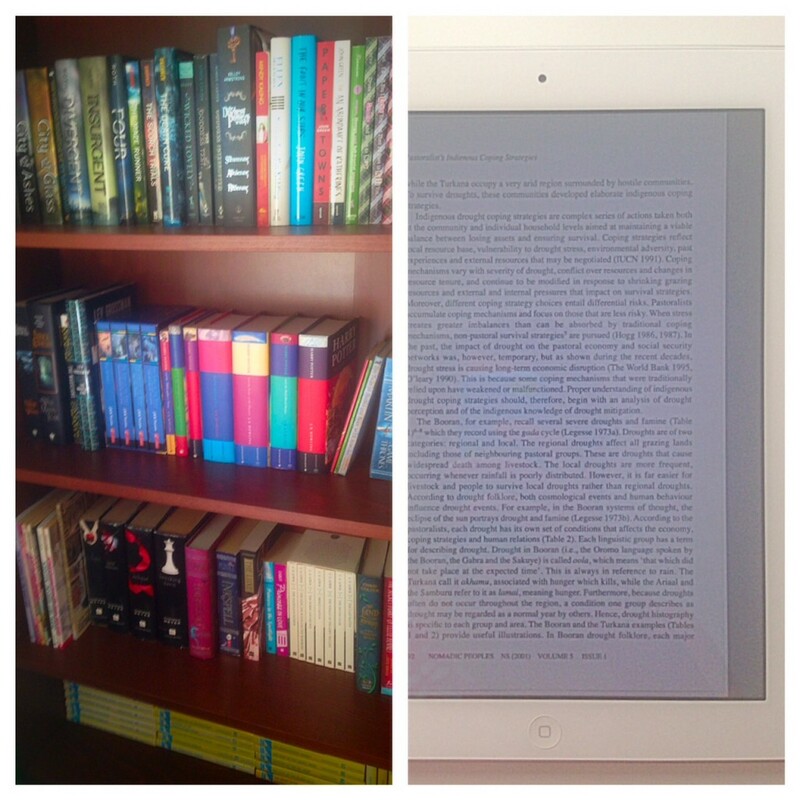 What are your opinions on e-books vs. physical copies?